Will Political Strains Pull The China-Philippines Cozy Relationship Off Course? China's leader seeks to bring an old U.S. ally into his sphere. But the Philipine people are sceptical that China will deliver on its promise of billions of dollars in aid. Chinese President Xi Jinping (left) shakes hands with Philippine President Rodrigo Duterte after a guest book signing at the Malacañang presidential palace in Manila on Tuesday. Duterte called Xi's visit to longtime U.S. ally the Philippines a "milestone." The optics were first-rate: Chinese President Xi Jinping welcomed into the Gate of Manila's Malacañang Palace by hundreds of cheering Filipino school children, uniforms neatly pressed and shouting "ni hao," Mandarin for hello. The two-day state visit to the Philippines, which wrapped up on Wednesday, was the first such meeting for a Chinese head of state in 13 years. President Xi and his host Philippine President Rodrigo Duterte lavished praise on their "milestone" get-together, and agreed to elevate their relationship to "one of comprehensive strategic cooperation." Duterte sought assistance for his ambitious infrastructure plan, while Xi sought a diplomatic coup — "extricating the Philippines from the U.S. sphere of influence," says Manila-based academic, columnist and author Richard Heydarian. 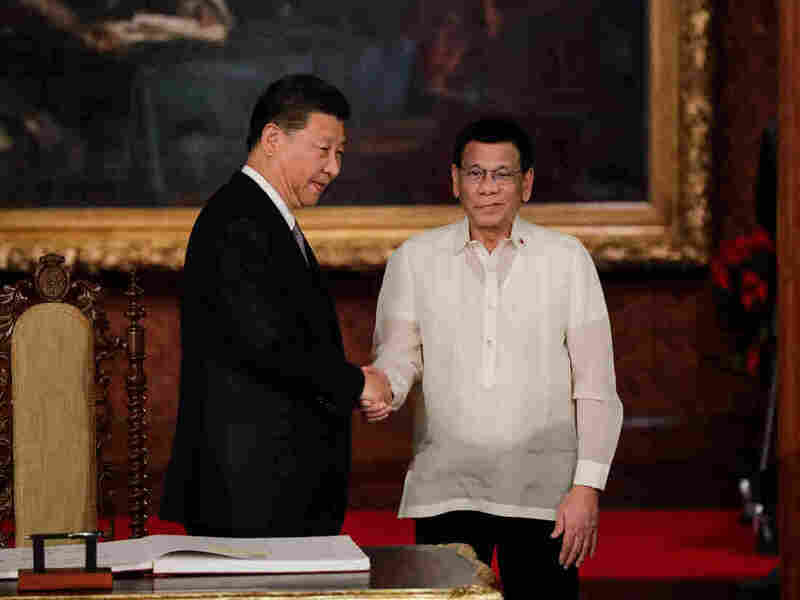 Both leaders made promises to cooperate in settling their countries' disputes in the South China Sea, where the Philippines maintains its right to some of the waters but China asserts claims to nearly all of them. But this week's high-profile diplomacy, meant to solidify the strategic realignment in Asia, ended in uncertainty. Deals were cut in a lack of transparency that irked critics. Others said the inked agreements — 29 in total — fall far short of the $9 billion in official development assistance that China pledged two years ago to improve infrastructure in the Philippines for its 105 million people. Nearly all documents signed this week were memoranda of understanding or other preliminary agreements; there was one loan agreement for a dam project worth $224 million, and a loan for a consultancy contract on a rail project for $280,000. Duterte secured the Chinese pledges of financial assistance during a visit to Beijing two years ago — a trip that showcased the Philippines' "separation" from its longtime ally, the United States. Last April, Duterte declared, "I just love Xi Jinping. He understands my problem, and is willing to help." However, Duterte's pivot to China, and his bromance with Xi, may not be paying the dividends that he had hoped. A review of data from the Philippines' National Economic Development Authority shows a wide gulf between the $9 billion China has offered to finance road, bridge and rail building, and what has actually materialized. Only three projects have broken ground: two bridges in Manila, and an irrigation system with a total worth of $124 million, according to government statistics. At least 17 more projects are at various stages of planning, awaiting Chinese government approval for financing or the nomination of Chinese contractors. Bloomberg quotes the Philippines' economic planning secretary, Ernesto Pernia, as saying that the process of securing loans from China 'seems to be moving slower' compared to getting assistance from other countries such as Japan, by far the largest provider of official development assistance to the Philippines. Part of Duterte's "Build, Build, Build" initiative, these are complicated projects, officials say, adding that bureaucracies take time. Philippines Secretary for Budget and Management Benjamin Diokno said he hopes that Xi will pressure his country's bureaucracy to hasten implementation of the China-financed projects. But analyst Heydarian says the slow pace of Chinese government investment indicates a political decision in Beijing that there's no need to rush in the Philippines. "This is embarrassing for Duterte and could cost him politically in the [upcoming] midterm elections, with the opposition and independent elements portraying him either as naïve or a Chinese lackey." He says there are doubts about whether China ever will fulfill its promises, "or whether it was dangling those incentives to lure the Philippines into geopolitical concessions." The biggest concession might have been Duterte's silence on China's occupation of the Spratly Islands in the South China Sea. The chain of 750 atolls, reefs, and islands has been claimed by six different nations: China, Taiwan, Vietnam, Malaysia, Brunei and the Philippines. Duterte's predecessor brought a case before the Hague-based Permanent Court of Arbitration over China's claim to "historic rights" to the waters and defended Philippines sovereignty over them. The court sided with the Philippines, ruling that China's claim has no validity under international law. Nonetheless, China scorned the Hague Tribunal, and continues to put military equipment and installations on the occupied islands. The Philippine Supreme Court's acting chief justice, Antonio Carpio, advised the government on the case and told NPR that "if China can claim the entire South China Sea as its own, Russia might claim the Artic, or India the India Ocean, and there would be no rule of law." On the sidelines of a Southeast Asian Nations summit last week in Singapore, Duterte blamed Western powers , including the U.S. and Australia, for aggravating tensions with forays of warships through the South China Sea. Trillions of dollars of trade pass each year through the sea, where the United States is challenging China for freedom of navigation. But Duterte went on, insisting that "China is there. That's a reality, and America and everyone should realize they are there." Early in his term in 2016, Duterte said that for the sake of bettering economic relations with Beijing, he would put The Hague ruling on the back burner. However, China and the Philippines returned it to the front burner this week, signing a memorandum of understanding to cooperate on development of oil and gas in the South China Sea. Details of the oil and gas deal have not been made public, and the secrecy surrounding it has Duterte critics in the Philippine Senate demanding full disclosure.That reignited debate over Duterte's refusal to confront China on its aggression in Philippine waters. Justice Carpio says jointly developing oil and gas could run afoul of the Constitution, which says the country's resources are for the exclusive use and enjoyment of Filipino citizens. But he argues that if China were to accept "half the income, half the gas, without disturbing [our] sovereign rights under [The Hague] ruling ... then we have found peace in the South China Sea." But Carpio also says that if Chinese leaders complied with the ruling, they'd risk being delegitimized in the eyes of their own people — whom they've wrongly convinced are the rightful holders of the South China Sea — and even "overthrown for ceding sovereign rights." "You have to take the very long view," Carpio says. It's "an intergenerational struggle." China's ambitious overland initiative to connect Asian markets with Europe also has been sharply criticized for drawing smaller countries into what critics, including Vice President Mike Pence, have called "debt traps. "Budget Secretary Diokno, however, says that 75 percent of the loans used to finance the country's proposed infrastructure boom will be sourced domestically. He's not worried about unmanagable debt from Beijing, and nor is Duterte who promotes China as a force for good. "It's a huge victory for Beijing," says analyst Heydarian. But he doubts whether what he calls the "China-Philippines flirtation" is sustainable. Defense analysts say the Philippine military dislikes the tilt toward China, and is standing its ground by restoring strategic relations with the American military and promoting more joint exercises with the U.S.
Public skepticism is also growing: An authoritative opinion poll released on the eve of Xi's visit found that nearly 9 out of 10 Filipinos think it's important to regain control of the islands China seized, and to uphold the Hague ruling. NPR producer Ella Mage contributed to this story.